This promotion can stop at any time - make sure the price of the ebook is $0.00 on Amazon.com. Some ebooks will only be listed as free if you're from the US and logged in to your Amazon.com account. If you are not from the US the Kindle edition might not be visible at all - search for the ebook on your local Amazon site. about this book: By reading this novel, you'll delve into the erased history of the Ancient Egyptian Amarna period! Most of the facts we have today come from overlooked wall reliefs that were missed in the destruction of the Egyptian Historical Record at the end of the Eighteenth Dynasty or the New Kingdom era. During the Amarna period, King Akhenaten flips Egypt's religion upside down and only allows worship of the Aten, the sun-disc. Insider note: This was the driving force behind the title and the cover art. I hope you enjoy it as much as I enjoyed researching and weaving together the little known facts into this engaging historical fiction story so many have come to love already. 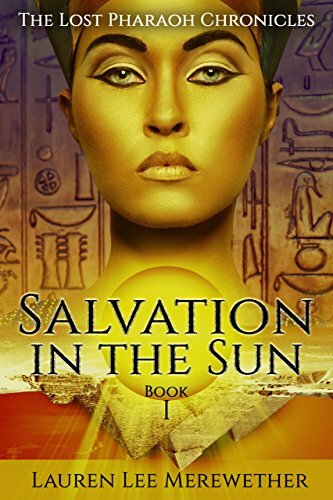 Reader's Favorite gave Salvation in the Sun a 5-star review: "If you're a fan of all things ancient Egyptian, from Nefertiti's bust to King Tut's tomb, this book is for you...In Salvation in the Sun, Merewether provides a very believable construction of the family relationships and the political and religious happenings during Nefertiti's childhood, her marriage as a teenager, and the many years she sat beside her husband, and at times in place of him, on the throne of a very large and powerful empire."